Bahay na Pula: A “ghost-hunter’s paradise”? If you’re hungry for a glimpse of the past and jumping through the ancestral houses in the province of Bulacan, “Bahay na Pula” is one of the unique houses to put in your check list. 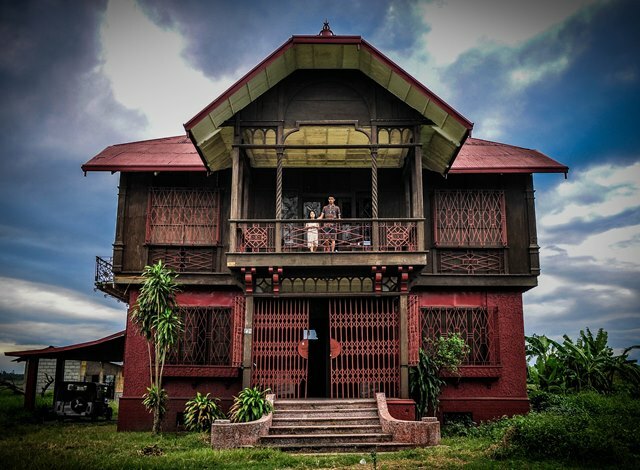 Located in Acsaho, San Ildefonso, Bulacan, people living nearby the house coined the term “Bahay na Pula [Red House]” because of its physical appearance. This ancestral house is famous for its ghost stories: Sounds of wailing girls and a ghost platoon of Japanese soldiers are just some of the countless stories told by the person who dared to visit this house. But apart from the ghost stories, the Bahay na Pula has more stories to tell. Built in 1929, it is the old mansion of the Ilusorio family. This two-floor house is standing alone in the middle of the vast hacienda of the family. And because of its separation from the other houses, it was used as a japanese base during the second world war. According to the caretaker of the house, the women of Mapanique (a barrio near the house) and other places nearby were held by the japanese soldier were brought inside the house, and used them as “comfort women”, some died during the stay in the house, crying and wailing for help. Moreover, Filipino guerillas caught by the soldiers were starved, brought to the large lawn beside the house tied together, then burned alive. The stories kindled the rumors that the house is a place for troubled souls seeking for justice. Bahay na Pula as a tourist spot…for ghost hunters? According to the caretaker of the house, who refused to give his name to us, a lot of television channels both local and international have featured Bahay na Pula, thus giving them a side income. This statement generated different opinions. Erin Abraham Crisostomo, a nursing graduate from Bulacan State University, said that the historical value of the house should be prioritized first before the ghost-hunting extravaganza. “Kung ang purpose ng pagiging tourist spot ay ang pagiging haunted house [ng bahay], hindi ako sang-ayon na gawin s’yang tourist spot. Natatalo n’ya kasi ang historical value. ‘Yong supernatural side naman no’ng bahay ay nag-arise lang dahil sa historical essence ng mga bahay. Sociological impact lang yung paranormal aspect baga,” he said. Monica Licaron, a Mass Communication student, also do not agree on the idea of making the house a “ghost-hunters’ paradise. On the other hand, some find the idea interesting. One of them is Sherwin Jalothot, an online journalist. “Well para sa'kin, interesting. Pero sa normal tourists, hindi siguro unless may historical value s'ya,” he said. Steffy Shannon Dy, a Bachelor Fine Arts student, also has the same opinion as Jalothot. “Para sakin, okay lang [na gawing tourist spot for ghost-hunting] kasi bukod sa part na po ng history ung mga lumang bahay, lalakas po siguro ung tourismo at parang mapopromotena din po ung place kung asan ung ancestral house,” she said. Setting aside the paranormal activities happening in the house, an ancestral should not be known as a haven for ghost. Instead, houses like the Ilusorio’s should be appreciated for its historical value. By then, people will realize that houses like this contributed well in the well-written history of the country. "Instead, houses like the Ilusorio’s should be appreciated for its historical value. By then, people will realize that houses like this contributed well in the well-written history of the country."